Think about the last time you felt fatigued, bloated, irritated, or sick. Did someone (maybe even yourself) give you medicine to help the symptoms? Did you ever find out the source of the pain or discomfort? As a Certified Holistic Wellness Coach, I help individuals find the source of their pain, provide solutions to heal, and share lifestyle tips that will nurture healthier living. Until recently, my dietary restrictions were few. I eat healthfully, and I watched my portions, but I didn’t restrict a certain food group. That changed as I learned more about how our food is processed in America (where I live) and what is allowed into our food sources. I don’t feel that any food source is bad, with respect for exceptions like specific allergies or personal medical conditions. Rather, I fear that the way certain food sources are processed and utilized restricts us from consuming and enjoying our food. Further, our food sources, processed under current guidelines (or lack there of) could be slowly killing us. No time? Good! Rusty gives chapter references for specific topics related to wheat-free living, so no matter your current education on the subject, you can skip through or target specific needs/interests given the day. Not ready? Fine! Use the book as preliminary study, as nobody is forcing you to sign over your rights to eat wheat or gluten after you purchase the book. You are in charge of your own body. Rusty authored an easy-to-read, inclusive tutorial on living a wheat-free lifestyle to serve as a daily coach as you implement new things into your diet. Scared? I was! There’s no need because Rusty shared excellent recipes and how-tos in his book. He also discusses going cold turkey or gradually cutting wheat and gluten out. Again, you have choices—you are in control. I can’t! You’re wrong. I challenge you to open your mind a bit and educate yourself on the evolution of wheat in our country. Even if you don’t change your own lifestyle, you could bless someone with your new-found knowledge of living wheat free and how wheat and gluten both affect our body’s systems, possibly even saving a life or two! Who doesn’t want to be a superhero? I put my green drinks into fancy glasses. I makes me feel like I’m celebrating. Toasting my health. Cheers! Blend milk, protein powders, almonds together well, then blend in other ingredients until smooth. Enjoy! What else will you find within the pages? Over 40 meal recipes that are free of wheat or gluten, tips and further explanation resources to key concerns, a kitchen checklist, exercise programs, how to dine out on a wheat/gluten-free diet, and ways to track your progress. It’s like you get a mini-coach and accountability partner with the book. It leaves this skeptical girl with nothing left to question or ask. 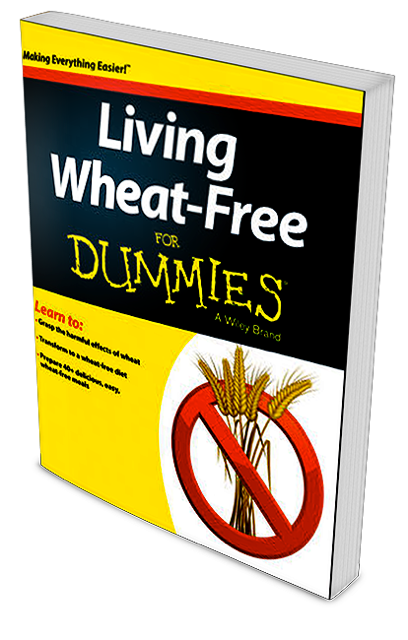 With Living Wheat-Free for Dummies by your side, you can confidently navigate wheat-free living and still enjoy a fit and fun lifestyle. You can order yours now on Amazon or through the author’s website at rustygregory.com.